It's a trend to grow accustomed to — exhibits at the MAC will now be coming and going more quickly than the past couple years, as the museum moves to a schedule intended to bring many fresh new experiences to its galleries throughout the year. Two weekends ago, the MAC debuted the newly arrived Treasure! exhibit, which fills the main basement gallery and several others through this May. Read all about what's featured in Treasure! in this week's Inlander, and also check out a slideshow of the exhibit's preview night by Inlander photographer Young Kwak. 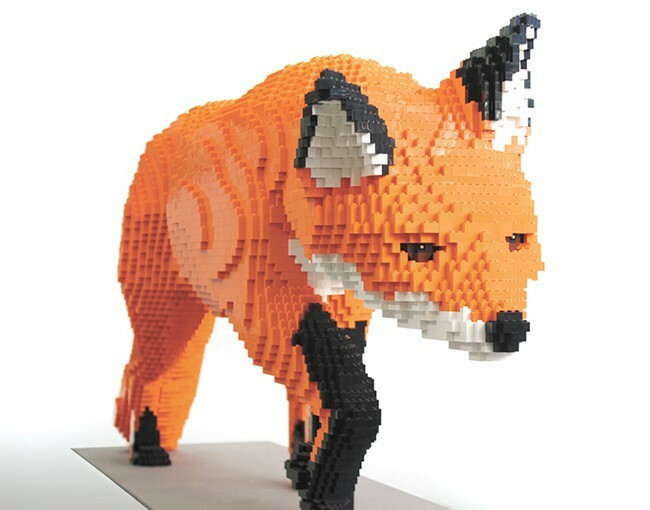 This massive fox made of Legos is one of many sculptures on display for Nature Connects. That first weekend of Treasure! was notably one of the busiest so far this year for the museum, as families and visitors of all ages flocked to see it and the massive Lego sculptures on display for the ongoing exhibit, Nature Connects. The incredibly popular display of 27 toy brick sculptures created by NYC-based Lego Certified Professional and artist Sean Kenney has been touring the country for years now, and wraps up its Spokane stay this Sunday. At the MAC, Kenney's stunning creations have been on display next to Lego masterpieces made by local kids and adults as part of a museum-sponsored contest that offered cash prizes to the top-voted submissions. The MAC staff went even further to promote the nostalgia-driven theme of Nature Connects by building three custom life-size Lego "minifigs" displayed on its campus. If you've not made it down to Browne's Addition yet to see the whimsical and creative Lego showcase, don't miss your chance since the sculptures are being crated up and shipped off to the next city after the museum closes on Sunday, Feb. 7. As the MAC continues to adapt to this new, faster rotation of exhibits, other changes in response to the needs of its visitors have arisen. Starting next week, on Tuesday, Feb. 9, the museum is opening the galleries for an additional weekday — formerly it was open to the public on Wed-Sun, from 10 am-5 pm — in hopes of providing a calmer, quieter time to visit. Admission on Tuesdays is also being offered at half-price, which staff hopes will be more appealing and affordable to retired visitors and families with young children. Tuesday admission specials are as follows: $5/adults, $3.75/seniors (60+), $2.50/ages 6-18, $2.50/college students with ID. Admission for MAC members and kids 5 and under remains free.